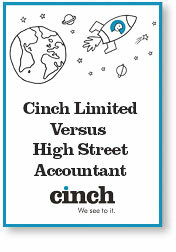 At Cinch we understand that one size doesn’t fit all and not everyone requires on going accountancy services. Our Cinch Limited service can be tailored to your individual business needs. Do you keep your affairs up to date throughout the year and just require assistance with yearend paperwork and submissions? Have you fallen behind and require assistance in bringing the book-keeping up to date? We will talk through your personal circumstances and advise you on the options available to ensure you are up to date and how you can stay up to date going forward.